Wye is a picturesque, peaceful Kentish town of half-timbered cottages and quaint, friendly pubs where you get the strong impression very little, apart perhaps from the addition of the odd Co-op or nail bar, has changed much in the last 500 years. In this bucolic scene, the Wife of Bath, with its handsome Georgian frontage and medieval cottage rooms, looks right at home; as English as mutton pie, as Kentish as hops or gypsy tart. Here, you think, I'll grab a room temperature pint of local IPA, sit by the fire and pick at some rustic local nibbles, and soak up the Best of British. Well, no. You won't be doing that, because the Wife of Bath's attractive edifice is home not to a traditional country pub, or even anything so 20th century as a wine bar, but in fact a serious, modern Spanish restaurant; two bright, spacious rooms populated by effortlessly attentive staff, serving the kind of high-end Iberian fare you would be more than pleased to pay for in Galicia, never mind in deepest Kent. It's the brainchild of Gordon Ramsay protegée (though don't hold that against him) Mark Sargeant, who bought the place in 2016 following the rampant success of Rocksalt in nearby Folkestone. I didn't make it to Rocksalt myself on this trip, but my parents, who are retired and don't need to schedule their days around office hours, visited on the Friday night and reported back: "lovely fresh seafood with fantastic views", so that sounds like a recommendation to me. Anyway, the Wife of Bath. Dinner began with a succession of substantial nibbles, first of which a single huge seared scallop, sat in what I think was some kind of pumpkin purée and topped with crisp shallots. You'd have to be dead inside not to enjoy a plump, gently caramelised scallop, sweet and fresh like this, the neon yellow of the sauce contrasting nicely with deep blue ceramic tableware. Cheese croquettas suffered slightly from underseasoning, but still had plenty of flavour and an irresistable delicate crunchy crust. They came topped with a surprisingly punchy chilli jam, which I like to think came from the farm we drove past on the Saturday that had a giant inflatable chilli parked outside it. Or maybe they just came from their usual Brindisa suppliers. Either way, nice chilli jam. Starters began with a buttery mound of wild mushrooms, topped with a duck egg, and surrounded by a wall of superior Ortiz anchovies. This was, as you might imagine, great - just the right side of rich, satisfying rather than overwhelming, the anchovies doing their wonderful umami-dense thing. Baked crab had another surprisingly powerful hit of chilli, a pile of pickled fennel to cut through the sweet seafood, and a couple of slices of excellent house sourdough, so no issues there either. Personally, I'm always slightly happier with cold crab meat than hot - something about the texture of hot crab is slightly unnerving - but it was still very nice. Beetroot salad is very rarely the most enticing option on a menu, but quite unexpectedly this was a highlight of the starters. Fantastic local beets, of all different shapes and sizes, alongside smoky charcoal-grilled courgettes, were studded with Valdeon, a salty blue cheese, and bouncy broad beans. It added up to the perfect late summer salad, colourful and textural, the kind of thing only the most accomplished and confident kitchens can produce - the Wife of Bath make it look easy. Had I been eating with a few of my more carnivorous friends the £100 12-years-old Galician sirloin to share would have been a tempting - in fact inevitable - proposition. But with mum & dad largely beef-free these days I was forced to go alone with a plate of boldly pink Iberico pork loin, though believe me it was no hardship. I'm yet to find any part of the famous black-legged pigs I don't love, and this was no exception - unbelievably tender and full of flavour, presented simply with a dollop or two of romesco and some toasted cauliflower as well as more wild mushrooms. It was one of those perfect main course dishes - a supremely good lead ingredient, sensitively presented with flavours and textures to let it be its absolute best. Wood pigeon, dark and smoked from the grill, had a powerful gamey flavour and the "spiced cherries" were a good foil for the bitter (though not unpleasantly so) meat. I think you either like game or you don't - I know at least one person who, fearless food adventure in most respects, can't go anywhere near a hung grouse or teal, despite mine and others' best efforts to convince her otherwise. Fine, but I consider grouse in particular to be one of the finest foodstuffs on the entire planet, and I can't help feeling she's missing out. Still, all the more for me I suppose - and she is at least saving a bit of money. "Pea and leek tart" was pretty generously proportioned for a starter ordered as a main, and the Idiazabal cheese used to bind it all together had an incredibly deep flavour. Some of the food at the Wife of Bath is solid, unreconstructed Spanish, but you will notice that much of the menu is a kind of Spanish/gastropub fusion, Brindisa ingredients and the odd technique like romesco to liven up what would otherwise be solid British dishes. This tart is a good example of that fusion style - the kind of thing you might order from a number of country pubs, only using much more interesting Spanish cheese than the usual goats or cheddar. Pre-dessert was a very clever coconut parfait topped with coriander. Probably not very Spanish - or English for that matter - but very successful, the floral herb really sitting well with the dairy. I've always said, if you want the measure of a restaurant, try their home made ice cream. Every bit of effort a kitchen puts into its ice cream is obvious in the result, and at the Wife of Bath their version, studded with raisins and soaked in Pedro Ximinez sherry, had a texture so utterly smooth and silky it almost had no texture at all. It just floated into you, a cloud of cream, sugar and sweet alcohol. And finally, an orange and saffron ice cream sandwich, topped with fresh local raspberries and micro basil. Another top bit of ice cream work, this also cleverly fused the British and the Spanish to great effect. Those of you familiar with the latest foodie obsessions will have probably noticed that there's been a lot of attention on Kent in recent times. It all began (probably) with Stephen Harris' the Sportsman, where in making his own seaweed butter and evaporating seawater to make salt, was one of the first pubs to demonstrate that hyper-localism can find an enthusiastic audience. More recently, just down the road at the Fordwich Arms, a different set of enthusiasts have taken the bounty of the Garden of England and run with it, creating a menu of genuinely astonishing class. I can also recommend the Goods Shed and the Corner House, both in Canterbury, where you can get your fill of Kentish goods without breaking the bank. The Wife of Bath deserves to be spoken about in this exalted company not despite the fact that it's a Spanish restaurant (of sorts) but because it has cleverly combined everything good about the fantastic produce available on their doorstep and the best of a cuisine practiced a thousand miles away. I'm not saying it's ever easy to run a great gastropub anywhere, but it's a model that has been thoroughly tried and tested, and in 2018 is almost (whisper it) becoming a bit of a safe option. Here in Wye, you can eat Iberico pork with local mushrooms, dayboat fish with Spanish anchovies, house sourdough and Spanish Tempranillo, and it all makes absolutely perfect sense. Why shouldn't the best Spanish restaurant in the county be in a sleepy half-timbered medieval town, 2 hours' drive from London? Viva Kent! I was invited to the Wife of Bath and didn't pay for dinner or accommodation, although we did pay for 2 nights in a different room in the building. Which was lovely, as you can see. 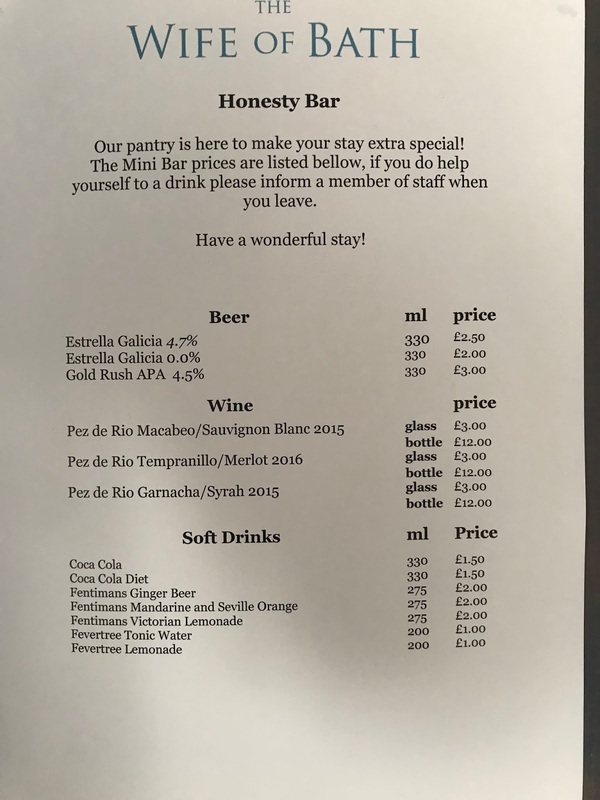 Also - check out the insanely low minibar prices. Great review and love the look of this place. 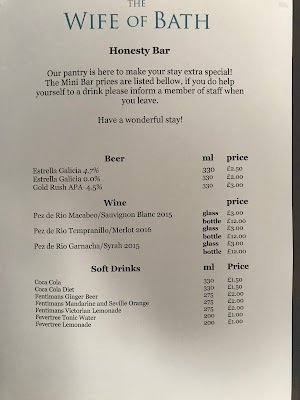 Still can't get my head round those mini bar prices!!! I went. It’s great. Sherry in the bedrooms, insanely good Spanish breakfasts and nearby walks through fields of wild garlic. You should add The Compasses Inn to that list as well. Great and ambitious food in a cosy pub just down the road from Wye in Crundale.